Arriving in Acapulco harbor at 10:00 last night, we were finally anchored by 11:05 pm – exactly 36 hours after leaving Huatulco on Monday morning. 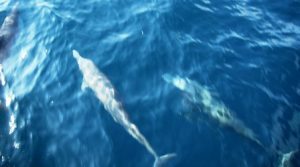 The 235-mile journey was pleasant, with seas less than 3 feet, winds less than 5 knots, and lots of wildlife for company. First, it was playing “dodge ball” with the hundreds of sea turtles along the way. Then yesterday morning, we saw splashing in the distance and thought it must have been fish. As we got closer, we found it was a grand ballet of rays (I think mantas, they had that ’57 Chevy grill on the front) leaping up to 10 feet in the air and flapping in unison. Tried to get pictures, but they were too fast and unpredictable. By sunset, we could see Acapulco looming in the distance, and as night fell, the city lit up the whole horizon. We entered the bay at 10:00 pm, and after a couple of tries, set the anchor in the east lobe of the bay, near a tall ship and the navy base. After an anchor dram (one for each leg) of frozen Absolut Citron, it was lights out, in hopes that the new refrigerator would run all night without draining the batteries. And glory of glories…when Ole got up this morning at 6, he found we can get up to 18 hours of battery life on this new household fridge – about 3 times more run time than the 28-year-old Amana side-by-side we cut out of here last Thanksgiving. I spent the morning washing the salt crystals off the pilothouse windows, while Ole went below to investigate a transmission leak and intermittent tachometer performance. We plan to haul anchor at noon, take a leisurely cruise of the bay, then make for Zihuatanejo which should be about 20 hours from here.